If you are a Canadian in the market for a second home, retirement home or investment opportunity, Tucson real estate is bursting with world-class golf, gorgeous desert landscapes, and five-star services. 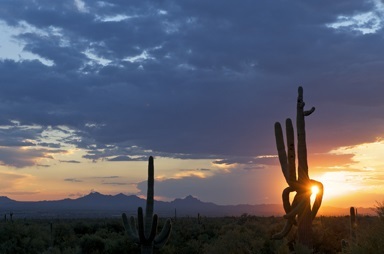 Phoenix is NOT the only option if you want to purchase a winter or vacation home in Arizona. While Phoenix does offer its own positive features, Tucson brings to the table certain perks that Phoenix simply cannot touch. For starters, Tucson is smaller and less populated than the massive Phoenix metropolitan area. To give you an idea of the size, Tucson is similar to Calgary, Alberta in size and growth rate. Additionally, Tucson is home to world-famous golf courses to fulfill any golf enthusiasts’ dreams. The annual Accenture World Match Play Championship has been played in the Tucson area since 2007 and is one of the most prestigious tournaments in the nation. The tournament has been played on the luxurious Jack Nicklaus Signature golf course at The Golf Club at The Ritz-Carlton, Dove Mountain since 2009. For discerning home buyers, The Residences at The Ritz-Carlton offers custom-built luxury homes in its high-end residential community. Those privileged enough to be homeowners in this community have access to The Golf Club featuring a 45,000-square-foot clubhouse complex that answers every wish of the avid or casual golfer. Beyond golf, Tucson is also the lucky city that hosts spring training for the MLB every year. Other sports events in the area include University of Arizona football, basketball, and more. And for those of you not into sporting events, Tucson is also the city to bring in the annual Gem Show each February; an event that attracts a tremendous number of people every year. Tucson is typically a few degrees cooler than Phoenix since it is in a slightly higher altitude. This is especially important during the hot summer months! The Tucson area also has a much more vibrant desert landscape than Phoenix. The Residences at Dove Mountain are located high in the Sonoran Desert, yet still just short drive to downtown Tucson, and offer spectacular views of saguaro cacti, desert trees, and wildlife with a backdrop of the breathtaking Tortolita Mountains. Plus, Tucson is highly accessible to Canadians looking to live in the area, with direct daily flights from Tucson to Calgary via Air Canada. The trip is a short 3.5 hours by air, making business travel worry-free. So if you’re looking for a second home or want to relocate to warmer temperatures, look no further than Tucson real estate. The exchange rate is in favor of Canadians right now and the Tucson real estate market is on its way to a full recovery meaning that real estate opportunities are practically endless for those looking to purchase in Arizona. For more information about The Residences at The Ritz-Carlton, Dove Mountain and all your Tucson real estate options, contact us or call 877-451-7205.